Take charge of the overgrown grass with Toros PowerPlex 14 BLDC String Trimmer. This cordless, 40-volt MAX string trimmer has a highly efficient brushless motor that supplies more power, a longer life and more run time than a brushed motor. 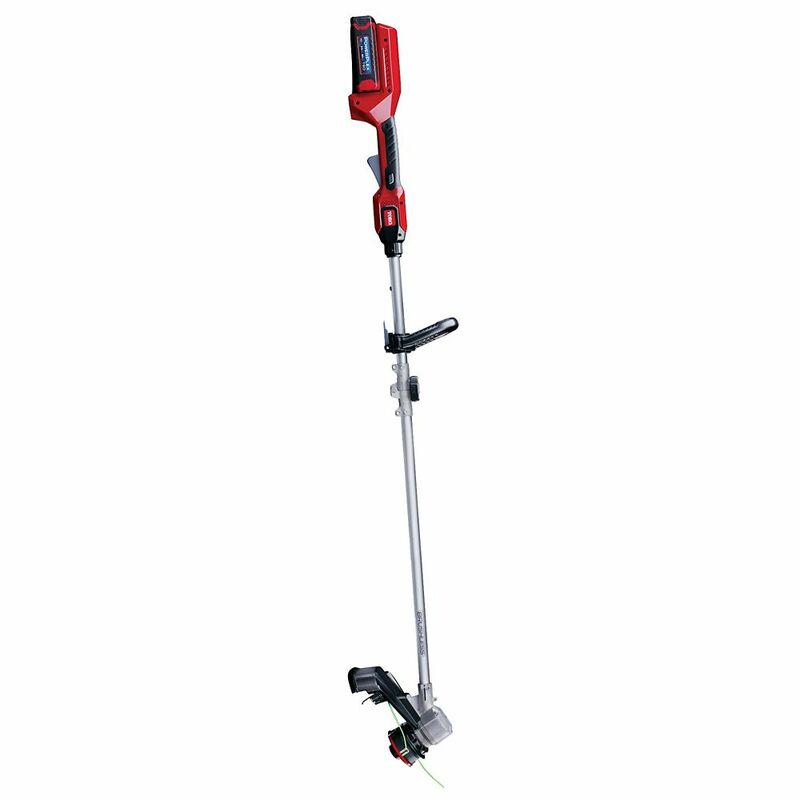 It is built for durability with its cast aluminum head, steel shaft and heavy-duty dual trimming line. The variable speed trigger allows you to run the machine as needed more power or more run time. Step up to this trimmer for a super powerful, efficient and long lasting tool. With 90 watt-hours, the T90 battery provides up to 40 minutes of run time and this battery charges in approximately 60 minutes in the quick charger. Take charge of the yard with Toro PowerPlex tools. The BLACK+DECKER 40V MAX* Lithium String Trimmer 13 inch is packed with POWERDRIVE Transmission and a 40V MAX* lithium ion battery, this power string trimmer has the muscle to tackle tough weeds and overgrowth. With an Automatic Feed Spool AFS to ensure continuous work without bumping. Adjustable height allows for ideal comfort during use. A simple Flip to Edge system by rotating trimmer head 180 degrees to edge along sidewalks and driveways. Powered by a 58V lithium-ion rechargeable battery, the all-new Poulan Pro PRST15i battery-powered string trimmer delivers the power, performance, and runtime typical of traditional gas-powered tools - without the hassle of mixing and storing fuel. With a built-in battery power meter, it's easy to monitor power usage, and the handle-mounted, easy-to-view battery power indicator guarantees you'll never run out of power mid-task. With other impressive features like push-button starting, variable speed control, digital cruise control, and integrated power boost technology, this quiet, lightweight, and environmentally friendly trimmer is easy to start and operate. It also features a telescoping shaft that quickly adjusts to a comfortable height for any user; a generous 15-inch cut path; bump-feed line advancement with dual line exit; and easy-loading trimmer head for fast, simple cutting line refills. Handle rotates to quickly convert to an edger for clean trimming around sidewalks. GAS-LIKE POWER, Attachement Capable and well balanced. Now with 10% more power, 50% more run time, and 40% lighter weight than the pervious model. For fast and simple reloads, this unit is equipped with the REEL EASY bump feed head with speed winder, that can be reloaded in 60-seconds or less. The cutting width is adjustable for longer run time or wider cutting width. Attachment capability means you can add on Ryobi Expand-It attachments, saving you time, money and space. 14-inch PowerPlex 40V Max Brushless DC String Trimmer Take charge of the overgrown grass with Toros PowerPlex 14 BLDC String Trimmer. This cordless, 40-volt MAX string trimmer has a highly efficient brushless motor that supplies more power, a longer life and more run time than a brushed motor. It is built for durability with its cast aluminum head, steel shaft and heavy-duty dual trimming line. The variable speed trigger allows you to run the machine as needed more power or more run time. Step up to this trimmer for a super powerful, efficient and long lasting tool. With 90 watt-hours, the T90 battery provides up to 40 minutes of run time and this battery charges in approximately 60 minutes in the quick charger. Take charge of the yard with Toro PowerPlex tools. 14-inch PowerPlex 40V Max Brushless DC String Trimmer is rated 4.5 out of 5 by 38. Rated 5 out of 5 by Pat12 from Very powerful This is my first Toro and I couldn't be happier. It is very powerful and does everything that I could want. Being that it's so powerful also means it is on the heavy side. For a man probably wouldn't be an issue. It's worth the weight. No pun intended. I was able to do my whole yard before I ran out of gas but the battery was still going! Well worth it! Rated 5 out of 5 by HomeDepotCustomer from Has real good power. Very impress with. Unit .... Has real good power. Very impress with. Unit . Rated 5 out of 5 by Chuzzy from When it was put together, I was concerned that the length might make it difficult to use, conside... When it was put together, I was concerned that the length might make it difficult to use, considering that l’m not really that tall, but on the contrary, I found it very easy to use. I loved the fact that I don’t have to worry about gas buying or dragging around electric cable. It’s a delight to use this battery powered trimmer. Rated 5 out of 5 by ANewWayToClean from I have a rough yard with many thick weeds that are determined to never die, and I use this weed w... I have a rough yard with many thick weeds that are determined to never die, and I use this weed wacker to declare war on the weeds. After 30-40 mins of warfare the battery dies. Impressive. I wish I had bought this sooner. Batteries really have come a long way. The battery charges in about 20 minutes or so (I haven't actually timed it, all I know is, it charges very fast). I'm impressed with the power this has. Gets the job done. Very happy. Rated 5 out of 5 by Chewey63 from Yeah, No more gas! This trimmer is awesome. Guaranteed to start first time every time. I've had numerous gas trimmers that have done the job but they all had one thing in common, eventually they don't want to start but not this one. Run time shouldn't be a problem either for most residential yards. Another bonus, you can use it without annoying your neighbors early mornings and late evenings. Rated 5 out of 5 by JW from The Toro Powerplex Trimmer is great. Still adjusting to the... The Toro Powerplex Trimmer is great. Still adjusting to the power it has in trimming the yard. I love it!